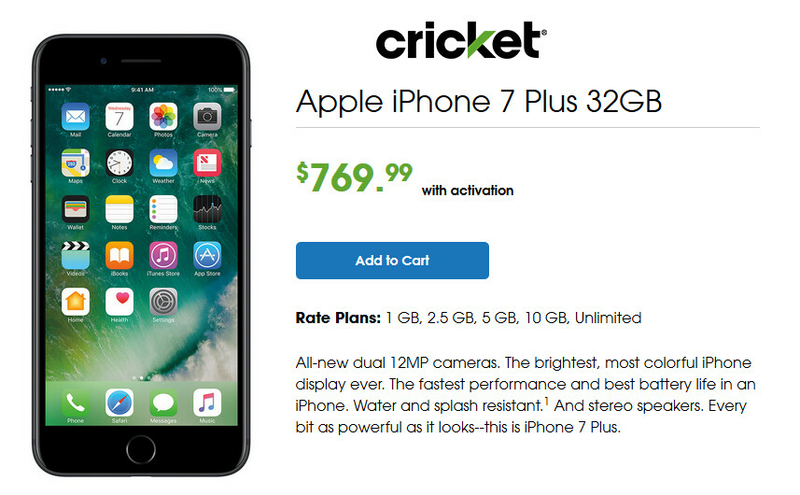 If you're dying for an Apple iPhone 7 or an Apple iPhone 7 Plus, but feel that a pre-paid carrier best fits your lifestyle, you might want to check out Cricket. AT&T took over the business back in 2014 when it purchased Leap Wireless for $1.2 billion. Starting tomorrow, Cricket will sell you the newest iPhone models directly from company owned stores or authorized Cricket locations. Over the weekend, the models were sold out online. Tomorrow will be the first time that Cricket subscribers can pick up the new handsets directly from inside a Cricket store. The 32GB Apple iPhone 7 is priced at $649.99 with activation, and is available in Black or Rose Gold. The 128GB iPhone 7 will cost $749.99 and is offered in Jet Black only. If the Apple iPhone 7 Plus is the phone that you want, the 32GB model is $769.99 with activation. You can select from Black or Rose Gold. The 128GB iPhone 7 Plus is yours for $869.99, available in Jet Black only. Cricket has taken its price-cutting ax and has used it on the Apple iPhone 6s and Apple iPhone 6s Plus. Both models are reduced in price by as much as $200. For example, the 16GB Apple iPhone 6s is now $449.99 (in Rose Gold, Space Gray, and Gold), and the 64GB Apple iPhone 6s Plus will set you back $649.99 in Gold or Rose Gold. Lastly, the 16GB Apple iPhone 5s in Space Gray is $199.99. Cricket does have an unlimited talk, text and data plan with 10GB of high-speed data for $60 a month ($55 with auto-pay). For $50 a month ($45 with auto-pay), you get 5GB of data. Pay $40 each month ($35 with auto-pay), and the amount of high-speed data that comes with the plan is 2.5GB. For $30 a month, 1GB of the unlimited data that comes with the package is high-speed. If you're interested in moving to Cricket while sporting one of the latest iPhone models, simply click on the sourcelink. In other news Bubba actually screws sheep.